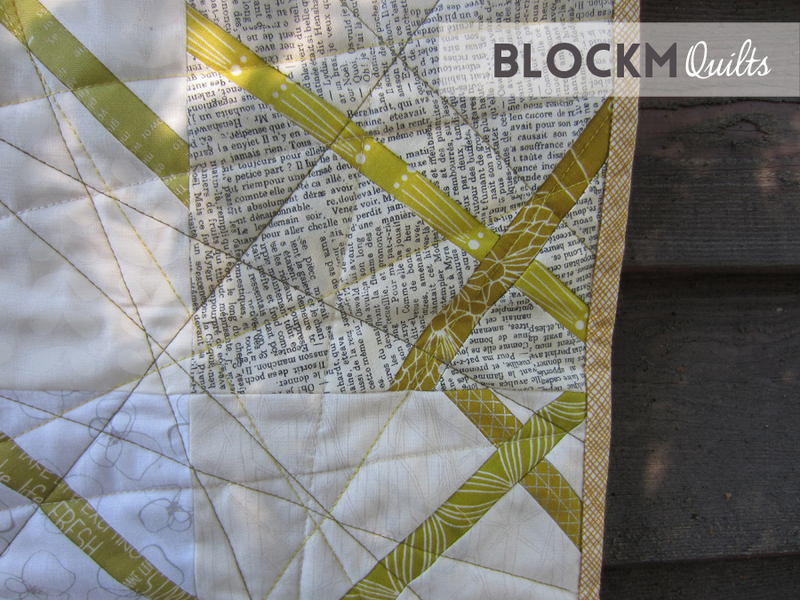 block M quilts: Cross Cut Quilt - a finish! The quilt is a result from a my first quilt-along (QAL) hosted by Debbie of A Quilter's Table. The QAL startet end of July and I opted for olive green/ mustard coloured strips whit low volume background fabrics. I ordered some matching Aurifil thread to go with the chosen colours and ordered them directly from a shop in Italy. I did that a couple of times already, it usually takes 3-4 days. But I needed to wait almost 8 weeks as their supplier had summer holidays. And when Italians have summer holidays there is nothing you can do - but wait. So this is why my finished quilt is a bit late, but I'm happy that I waited because the quilting turned out so nicely. I used beige, two different olive greens and a mustard colour and did random straight lines. I'm very happy that no puckering appeared with all those straight lines crossing over. This is also my first small quit. It measures only 58 x 58 cm/ 23 x 23 '' and it will be a wall hanging quilt. It was so great to take part in this quick little quilt along! Thanks again, Debbie, for hosting it! I had just joined Instagram and the interaction on IG is just great! Here is the link to the other quilts, there have been more than 80 participants and the variety of gorgeous quilt s is just amazing! It came out beautifully! Well done! Wirklich hübsch, die Farben sind klasse! oh yeah! Definitely worth the wait! 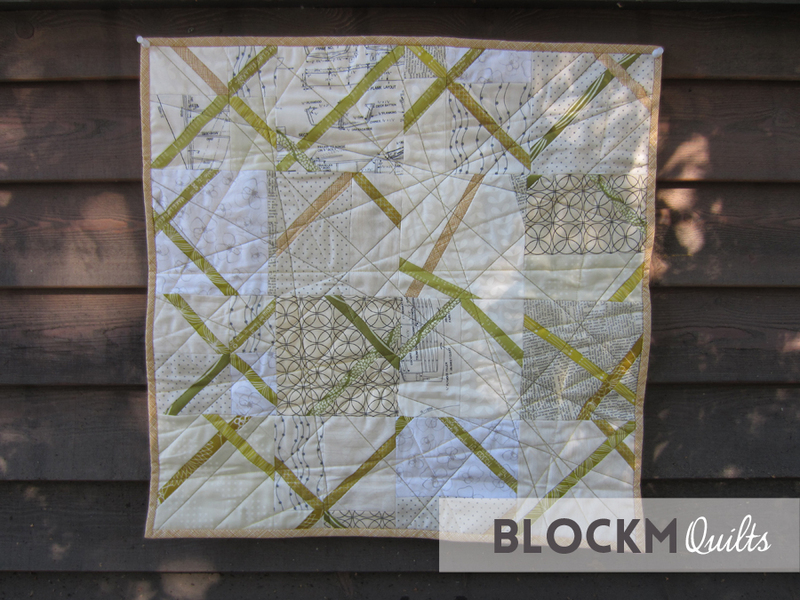 Your beautiful quilting just makes it!! SO glad you joined in and glad that you enjoyed your very first QAL! ;-) I'm happy to have been a part of that! Der ist wirklich schön geworden und die Farben gefallen mir sehr gut. Es war spannend zu sehen, was alle aus ihren zerschnittenen Blöcken gemacht haben. Und das Quilting ist auch perfekt. Da hätte ich auch aufs Garn gewartet. irgendwann probier ich auch mal dieses Aurifil aus. Toll ist der geworden! Gefällt mir sehr gut! I really enjoyed following you and the other participants along on the QAL. The pattern/ concept is pinned and on my 'one day' list. Enjoy your new wall decoration. It turned out great!